As a boy who grew up on a farm I enjoyed the routine of going into to the local town on Fridays to do the shopping. One of the treats was to visit a small general store that doubled as the local toyshop. Many fascinating hours were spent drooling over the toys and trying to coax our reluctant parents to cave in and buy something we longed for. Some times we were lucky, other times we returned home only with our dreams to play with. I had a flashback of this experience recently. Attracted by a display of rainbow colored windmills, I walked into Stranger than Paradise, a beautiful little toy and gift shop recently opened at 101 Errol Street. Stranger than Paradise abounds with a thrilling array of brightly colored toys that children and people of all ages will enjoy. It was fascinating to find such finely crafted wooden toys that I myself would care to own, soft toys that you would love to take home, and a well-chosen array of cards and small gifts to suit many occasions. Stranger than Paradise takes its name from the 1984 deadpan comedy film directed by Jim Jarmusch. The title’s translation into a name for this new business is the fulfillment of a dream for Lucia and Matthew who are to be congratulated on their creative initiative. Stranger than Paradise specialises in well-built, unusual classic toys and gifts not found in regular shops of this kind. 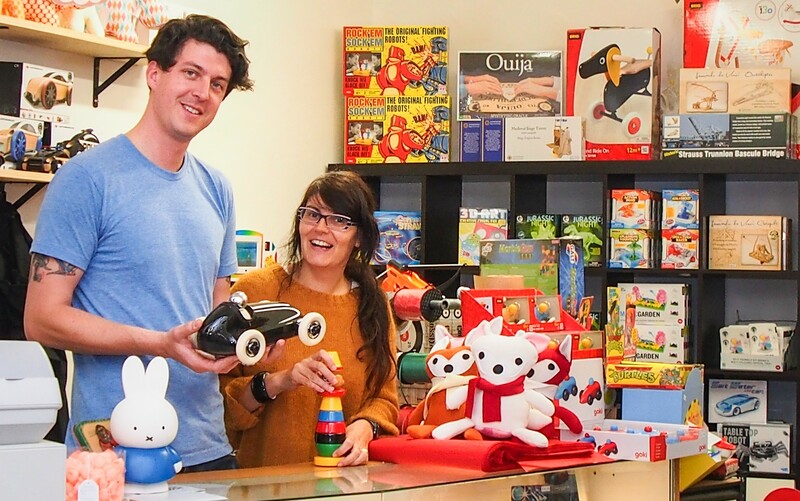 Owners Matthew Aldridge and Lucia Di Mauro, who have long standing connections with North Melbourne, actively seek out high-quality handmade European and locally produced gifts and toys. They display products that are not in the usual ‘Disney style’, that are BPA free and manufactured from recycled materials. Stranger than Paradise’s range of gifts begins with what Matthew Aldridge calls ‘pocket money toys’ from $5.00. With delight he tells of watching a child counting out his carefully saved coins to make a purchase. The range available includes the quirky and the more sophisticated, right through to once-a-lifetime collectable gifts for that special occasion. If you are looking for something different that is well-made and memorable, that will inspire a child and perhaps become a keepsake in the next generation, Stranger than Paradise is the place to go. As a colorful and intriguing addition to the Errol and Queensberry Streets precinct, Stranger than Paradise is a tempting source of playful and wonderful gifts suitable for people of all ages. And since Christmas is rapidly approaching Stanger than Paradise has a whole new range of treats to suit your needs for giving this season. Stranger than Paradise is a fine compliment to the gently expanding retail sector in the area. And it will be fun to see how their son Rocco will respond to the enviable prospect of growing up surrounded by the wonders available to him! Visit Stranger than Paradise at 101 Errol St, North Melbourne. Their website is strangerthanparadisegifts.com or call them on 9005 8101.